Control surface emulation & MIDI tools. Works directly with native MIDI drivers. TouchDAW is a full-featured DAW control and general purpose MIDI control app. It allows you to tweak a large set of parameters in popular digital audio workstations as accessible through standard hardware control surfaces. Version 1.3 has dedicated support for Cubase / Nuendo, Live, Logic, Pro Tools, Sonar, FL Studio, REAPER, Reason, Studio One, Samplitude, SAWStudio and Digital Performer (7.2+) workstations. Standard functionality like mixer and transport operation will be accessible in other applications as well. As of version 1.1 the app can also send MIDI Machine Control (MMC) in parallel with or alternatively to standard DAW control. TouchDAW works with RTP or multicast MIDI over WIFI and is directly compatible with Apple’s Network MIDI implementation in Mac OS X, native RTP MIDI implementations for Windows and ipMIDI. There is no computer side server or protocol conversion software required. 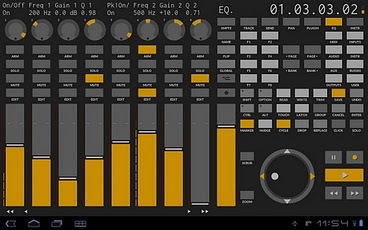 Version 1.2 adds support for MIDI over Bluetooth and tethered USB connections. Try before buy! The free version – though feature limited – is mostly identical and will let you check if things are useable with your network setup before spending money. The app needs some initial configuration, see website (also linked from the app’s info menu) for help.